The Chicago Booth Kellogg School Financial Trust Index is showing some improvement over the last year. While these numbers are not impressive, it shows that there is a growing comfort with our financial institutions. This improvement suggest that some of the negative rhetoric that has been associated with the post financial crisis environment is starting to decline. Still the trust levels are similar, within 5%, to those found in December 2009. The surprising number is the low trust of the stock market. While the market is up substantially in the last three years, retail investors do not have much trust in this key institution. 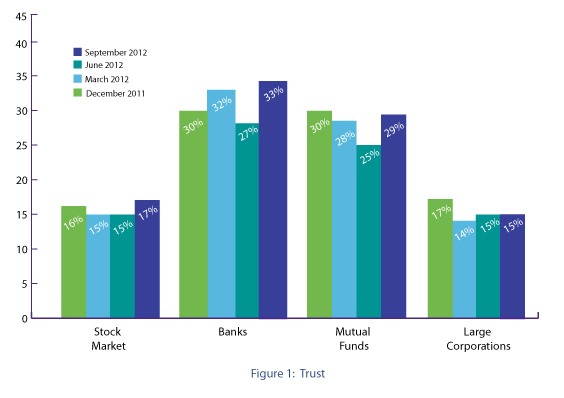 It is also surprising that banks have the highest trust levels, much higher than large corporations. What happened to the Wall Street versus Main Street divide? In spite of all of the changes in the global economy, the relationship between the dollar and equities has stayed relatively stable. The negative relationship between holding dollars and stocks as a risk-on versus risk-off trade is still in place. There have been some periods of reversal, but the strong negative relationship is still hard to trade against. 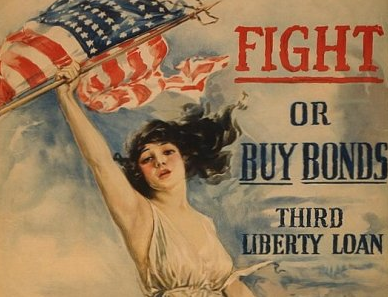 Poor economics will boost the dollar and cause a dollar sell-off. The relationship is less strong for the S&P 500, it gets stronger for the MSCI world and emerging market stocks. The dollar is still a hedge of choice for markets when it comes to risk trading. 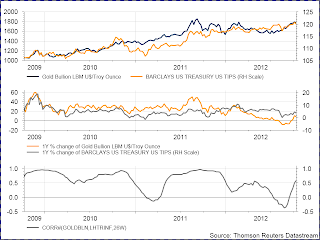 This has a negative impact on currencies as an independent asset class. The Bank of Japan is planning to offer unlimited low interest loans to lenders to boost credit demand. It will offer terms of up to four years based on the overnight call rate, .1 percent. The BOJ also plans to increase its holding of REITs to 130 billion yen in 2013 over the 120 billion yen used this year. The bank also increased its asset purchase fund by 11 trillion yen to 66 trillion. The BOJ is starting to throw the kitchen sink at monetary easing. The yen has declined by about 2 percent since the beginning of the month. The Japanese economy needs a boost and a declining yen would be helpful. The BOJ needs to match some of the strong stimulus used by the Fed , ECB, and BOE. 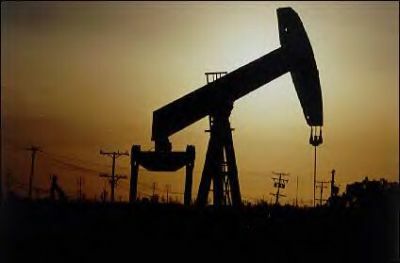 US oil production is growing at such a pace that it may soon overtake Saudi Arabia as the top oil producer. US oil production peaked in 1970 at 11.7 mbpd. It is now up to almost 10.9 mbpd. This is the fourth yearly increase and a gain of 7% this year is the biggest increase since 1951. If you include biofuels, the production next year will be 11.4 mbpd. The Saudi production is 11.3 mbpd. If there is any pullback by the Saudi's, the US will be the largest producer. Of course, the demand in the US is over 18 mbpd, but, the amount imported as percentage of the current account deficit is declining. The trade deficit drag from importing expensive oil is over. A peak oil problem seems to be an issue of the past. There is a strong battle between coal and natural gas as power substitutes. As the price of natural gas has fallen, the demand has gone up significantly in the power sector. Natural gas can be used for on peak power generation and competes directly with coal. If fact, natural gas became cheaper than all coal sources earlier in the year. The success in power generation switching has now come back and pushed prices above coal. The result is that running coal for power is now cheaper.Gas demand should decline until prices again fall below coal at which time there will be switching. The world is a little more complex but the switching issue will be a major decision variable in any gas or coal trade. The UBS V24 carry index shows there is just not much going on with this core FX strategy. 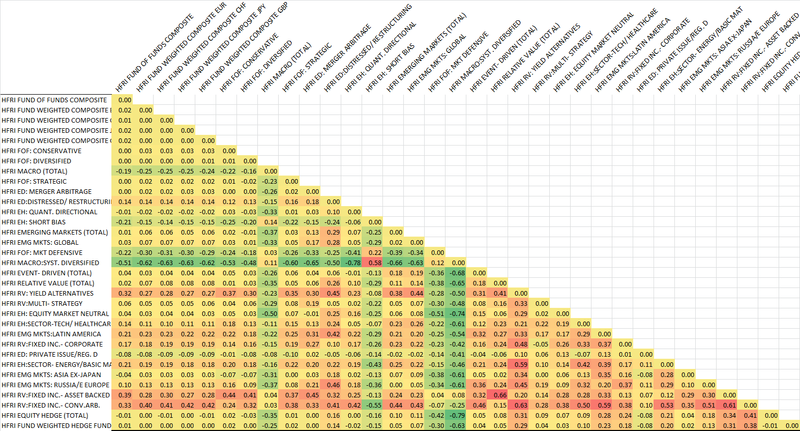 For the last year there has been no change in carry performance. Over the last five years there has been a decline in the returns for the strategy. Performance gained after the financial crisis in the third quarter of 2008, but there have been some larger declines associated with the EU sovereign problems. The decline in volatility has not bee a help for the strategy. The performance has moved lower with the decline in yields around the world. The yield differentials are low. The QE programs around the world has not helped carry performance. The CME announced that they will purchase the Kansas City Board of Trade futures exchange. Kansas City was one of the last holdout as an independent futures exchange from the great exchange grab by the CME and ICE. CME will have control of most US futures trading by volume and open interest. It has a monopoly on exchange services and the fees that go with it. (In fact, institutional investors pay more in exchange fees than in brokerage fees.) The power of networking is very strong with exchange trading. One dominate exchange will usually maintain a monopoly for trading given this is where liquidity will be centered. The agreement will allow the exchange floor to exist for another six months but then will go electronic. There are some advantages with cross margining between wheat contracts, but once again there will be limited choices on where trades can be made. There is no competition on exchange services in most futures products. The monopoly is with the CME and this will have an impact on innovation in this industry. The Wall Street Journal printed a fascinating interview on Zhang Weiyang, one of China's leading economists. He has criticized the government on their stimulus packages as a misuse and misallocation of resources. How you spend stimulus money matters. Just priming the the pump through extended bank loans to state enterprise will not provide the needed economist structures for sustained growth. The "China Model" of government intervention is not capable of making the proper allocation decision in a complex economy. These are views that do not come from the Keynesian playbook. While he has developed his views independently, he has all of the traits of an Austrian School economist and a follower of Hayek. His views also are very appropriate for the US. If easy money was the cause of the bubble in the Chinese economy, then continued stimulus through further easy money will not solve the problem. Economic adjustments have to be handled through the market process.The same can be said about the US policies. If easy money during the Greenspan era was a cause of the housing bubble, then providing more easy money without a thought of the transmission mechanism is also bankrupt. Fiscal policy also can misallocate resources. The economic systems have to change to allow the market determine allocation decisions. These views are never acceptable by government policy-makers but the discussion is critical for how the global economy grows and adapts. Improvement in productivity is still the driver for longer-term food prices. A recent USDA study in the September issue of Amber Waves shows some of the significant benefits farmers have developed to feed the world. Inflation adjusted agriculture prices are down. They have been in a downtrend for a century. 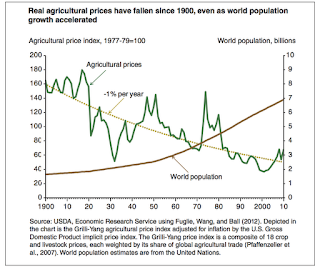 There is no food shortage even with a significant upswing in population growth. There have been swing in the price of ag commodities but the trend has not been broken. The reason for the continued downtrend can be broken into four parts. Land expansion is a small part. Irrigation is also a small part. 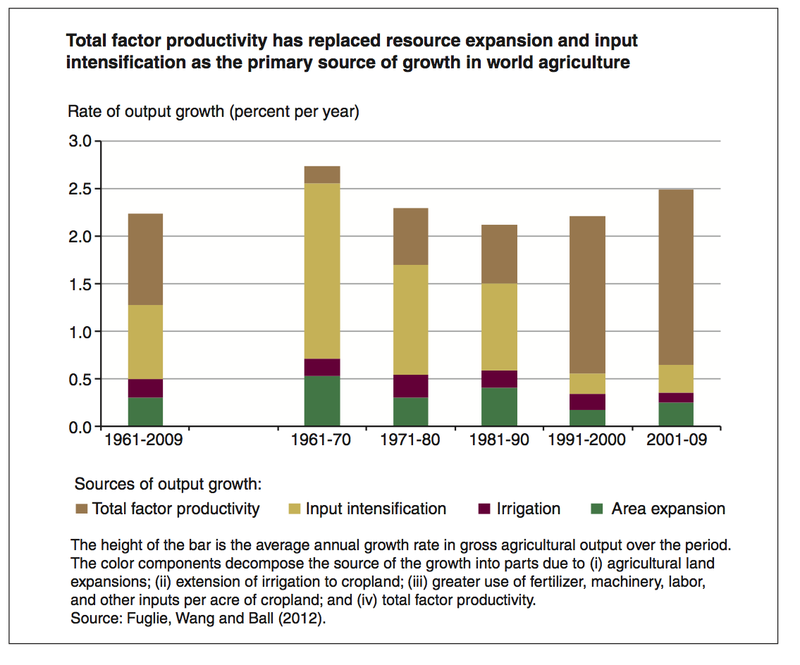 The majority has fallen between greater use of inputs such as fertilizer, labor, capital and productivity. Of the last two, input intensification and factor productivity, it is total factor productivity that has been the most important driver over the last two decades,yet productivity is often hard to forecast and model. There is a innovation component that cannot be guaranteed. 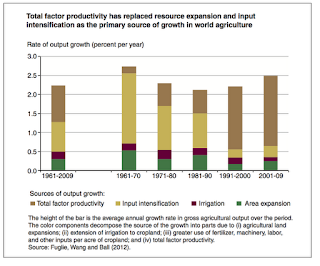 Total factor productivity (TFP) is the sum of all inputs for a the production of a crop versus the total output. Crop yield improvements have been steady at between 2- 2.5%. It is taking us less resources to gain those yields. 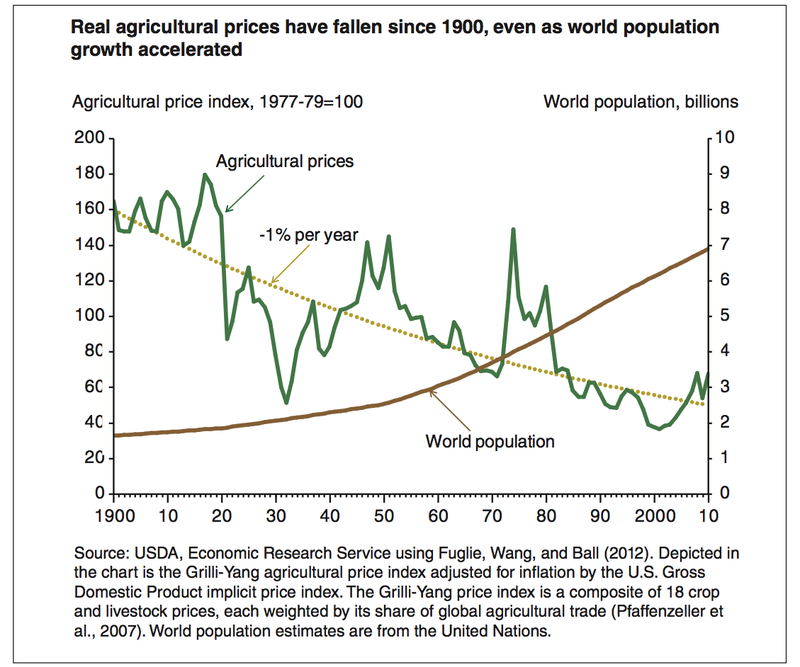 There is also a differential between developed and emerging economies with food production. Emerging markets in South America have been using more land for production which has improved output, but the amount of land that can be used in the US is constrained. To get more output, there has to be higher productivity. That goal has been reached over the last few decades, but there may be a limit on the amount of improvement. The improvement in TFP will be the driver for higher prices in the agriculture sector. With current low inventory to use, the risk of a tail event or failure is higher and TFP may not bail the food system out. 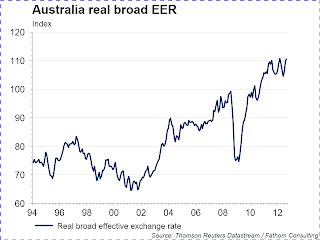 The demand for Australian commodity products has declined, but there has not been a decline in the Australian dollar. Capital flows dominate trade flows. While the AUD has fallen into a range, it has not backed-up from its highs even with less demand for coal, iron ore, and other natural resources. Australia has been resource country of choice for the Chinese. With a slowdown in Chinese growth, there should be a spillover to Australia. The export market has slowed yet the trade cycle does not seem to show a behavior that would be consistent with declining export trade flows. 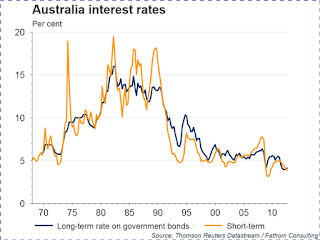 This is partially because interest rates are still high in Australia versus the rest of the G7, so capital flows dominate the trade thus keeping exchange rates high. 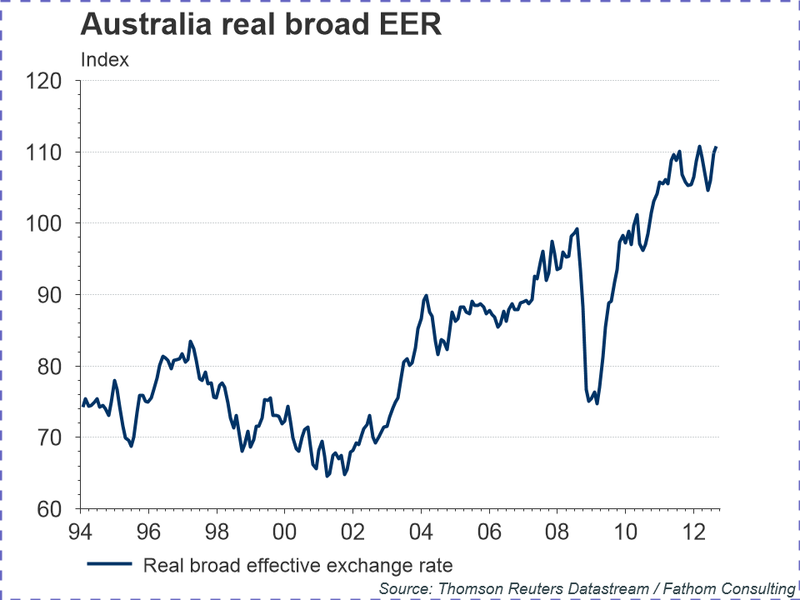 The Australian economy should be resource focused but has now become a place to hold wealth at differential of 400 bp on an unhedged basis. 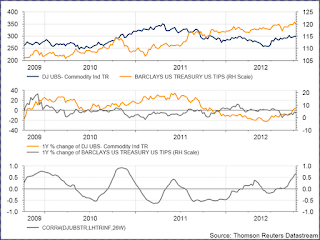 Commodities are not highly correlated to the TIPs market. Gold on the other hand has shown a more consistent relationship. 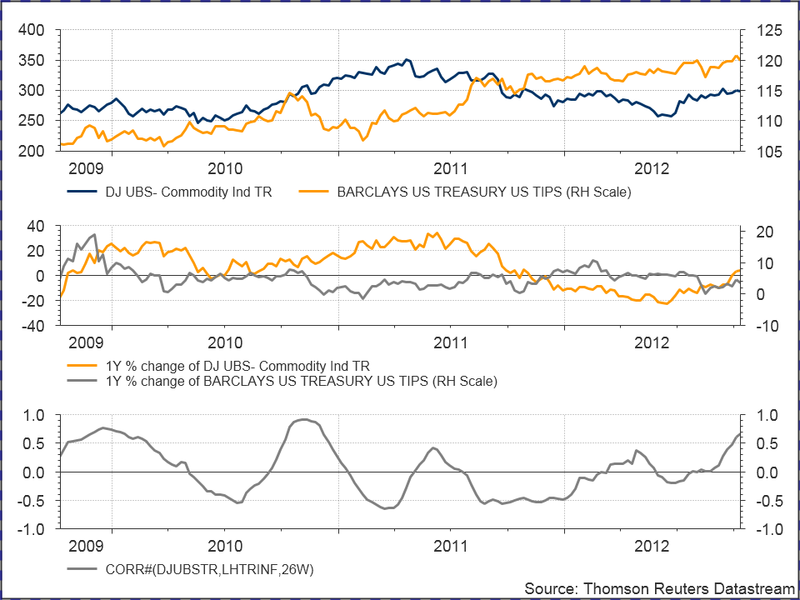 A comparison of the DJUBS commodity index and the Barclay's TIPs index over the last three years shows that there is little relationship between the two. 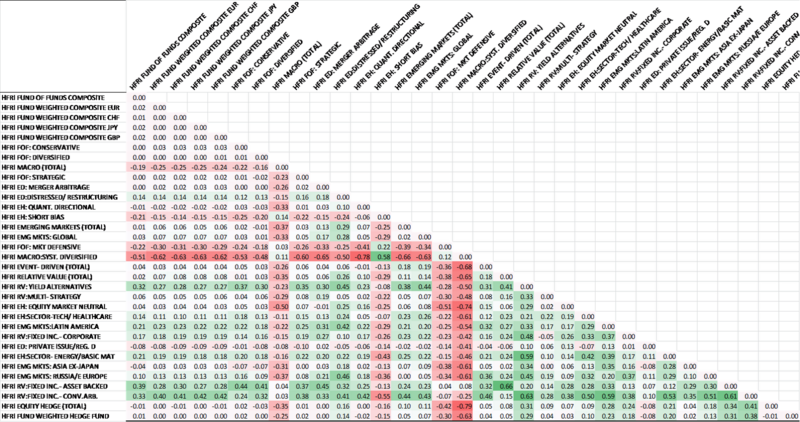 The rolling correlation shows that there is a strong movement from positive to negative moves. Overall the correlation is low. The rent history suggests a strengthening of the link but these periods do not last for long. 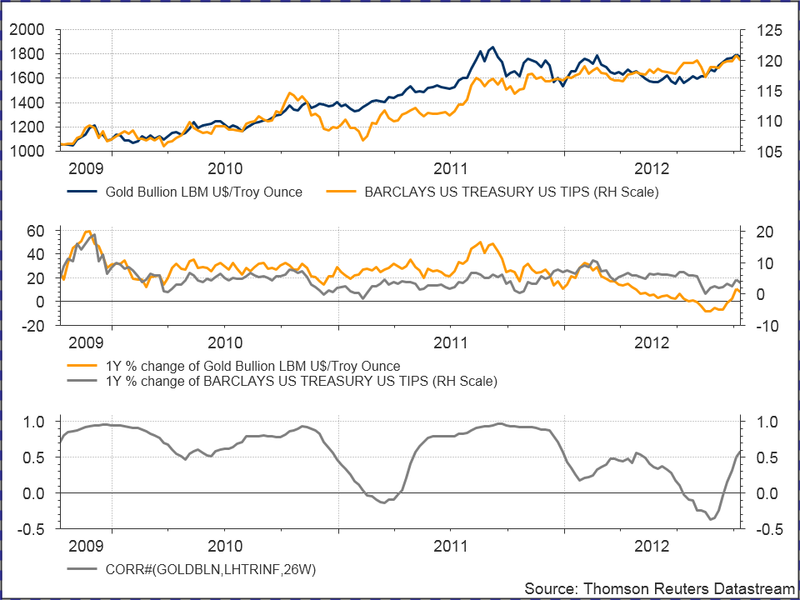 The relationship between TIPs and gold is much tighter. In fact, there is reason to believe that the gold TIPs relationship is exploitable. 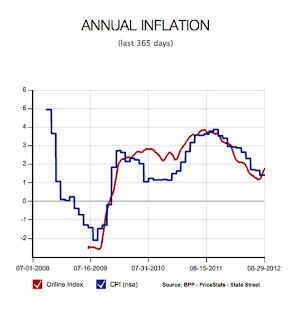 Given both are supposed to be inflationary expectations, they serve as closer substitutes. Commodities move with the business cycle but peak later. The graph above shows some of the unique features with commodities as an asset class. First, the early 2000's were the period of a super cycle in commodities that was unrelated to the changes in GDP and industrial production. Second, the recession in the US already began before there was a peak in commodity prices. Third, the recovery in commodities came later then the recovery in the real economy. Fourth, the peak in industrial production came first and then there was a peak in commodity prices. Finally, the rent upturn in commodities does not follow the pattern that we have seen in the past. 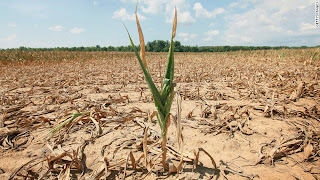 The recovery has more to do with supply shocks such as the drought in the Midwest then the fluctuations in the real economy. It is hard to predict the future and anyone should be careful of anyone who says they can. 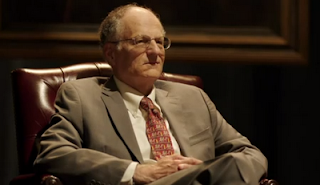 The Ally Bank commercial is a humorous view on the prediction game. Even nobel prize winers have a hard time. If we look at the Greek crisis as really starting to have an impact on financial markets in May of 2011 when the threat of failure increased, we can see a clear divergence between the US and Euro-zone. 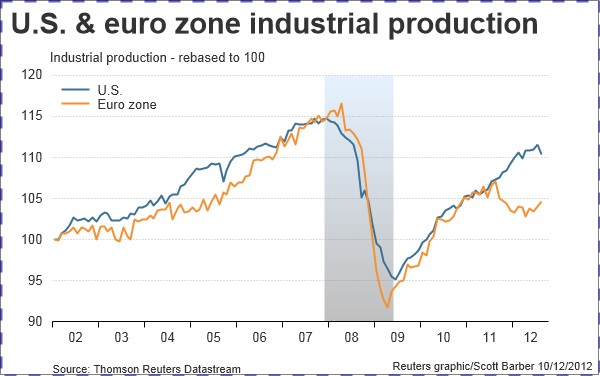 Prior to the Greek crisis, the industrial production numbers followed the same track. 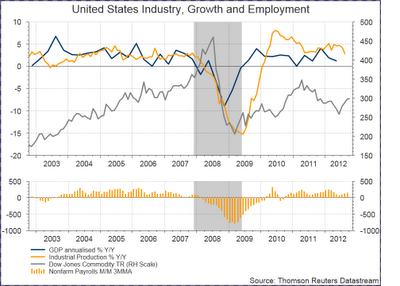 The US may have increase at a faster pace in the early 2000 period, but the direction was the same. The direction has changed over the last 18 months. The US seems to be slowing while the EU is stating to show some improvement by the divergence will still be a key driver for monetary and fiscal policy. There will also be a divergence between equity markets with the for core differences in economic growth. There is a strong reason for the strong demand for the S&P 500 versus the Euro Stoxx. index. 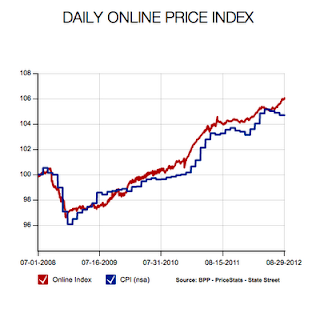 The billion price project at MIT can provide good back-up support for inflation numbers. The billion price project uses on-line information to measure and m monitor the prices of thousands of goods in order to determine the true inflation rate in real time. The numbers suggest that it tracks closely with the CPI inflation rate generated by the government. 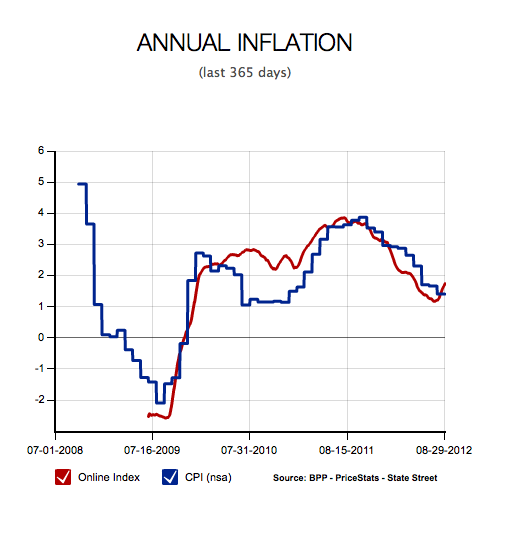 Nevertheless, recent numbers suggest that inflation is starting to rise. The volatility for natural gas has increased substantially with the overall decline in the price level. The change in volatility is related to the strong structural changes in the natural gas market. The shale gas development from fracking as pushed significant new supply into the market which has lowered prices, but the cause of the increase in volatility is associated with the demand side of the equation. As the price of natural gas has fallen, it has become more of a close substitute for coal. The elasticity of demand has increased because the price for switching between energy sources has become more operational. Lowering of gas prices will increase gas demand and switch off coal usage. An increase in price will lead to switching back to coal. Hence, if there is a demand shock that will increase power usage small changes in price will lead to larger changes in demand. We expect that coal - gas switching prices will con tune to cause high volatility in gas prices for the foreseeable future. Volatility may decline but the overall level will stay higher than what was seen in past periods and the volatility of volatility will stay high with spikes in volatility associated with demand or weather shocks. 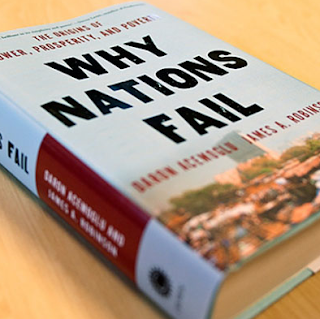 Why Nations Fail may be most important economics book of the decade. I waited too long to read this ambitious piece of research. The issue of how nation states help to generate growth is one of the most fundamental questions in economics. Look at the problems in the US, EU, and any of the emerging markets and you realize that institutions matter. If you can determine the drivers of growth and the factors which lead to successful nations, you will be able to make the lives of billions much better. Everyone lives in a nation state, so the structure of nations will effect the wealth and consumption of everyone. The premise of this work is that political and economic structures matter. You cannot talk about growth without discussing the institutions surrounding the growth. Capital and labor are not constraints, political institutions are the constraints. The example the authors provide are very compelling. Look at the difference between North and South Korea. Same culture and geography but very different impact on the livelihood of people in each country. Look at the difference between those living north or south of the Rio Grande between the US and Mexico. Same culture. Same geography but very different income levels. Countries are not predestined to failure. They have the ability to be successful if there are the right institutions. There needs to be property rights. More importantly or more fundamental, there needs to be democracy or political institutions which do not lead to a ruling class exploiting the people and resources that are available within the country. These are all themes that have been discussed by some of the leading political economists, but there has not been a work that has matched the political theory with data and history the way done with this single book. The importance of this book transcends the history of emerging markets and can be useful for looking at the OECD countries. The United Sates may fail if it does not take the message of the authors to heart. The same applies to Europe. 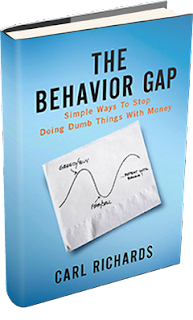 The Behavior Gap is a nice little book on the mistakes we make investing. Much of what is discussed has been researched and mentioned before, but Carl Richards presents it in a fresh way that may sway the views of many retail investors. He uses napkin graphs to present his points. They are available on his website. I have presented one here which is simple but illustrative. We engage in the behavior of buying markets when they move to highs because of greed and then we sell at the lows because of fear. When will we learn. 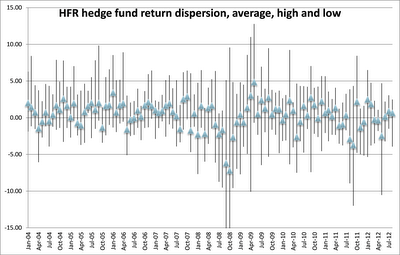 Correlations have gone up across hedge fund strategies since the financial crisis but there are some exceptions. We see that the correlation with global macro and systematic macro (managed futures) has fallen when we compare the most recent three years post years and a similar period pre-crisis, 2003-2006. The green boxes shows where there has been a fall in correlation and a diversification benefit from holding the strategy. This is one of the key reasons why there is a strong interest in global macro relative to other strategies. The second graph provides some explanation for the increases in correlation. 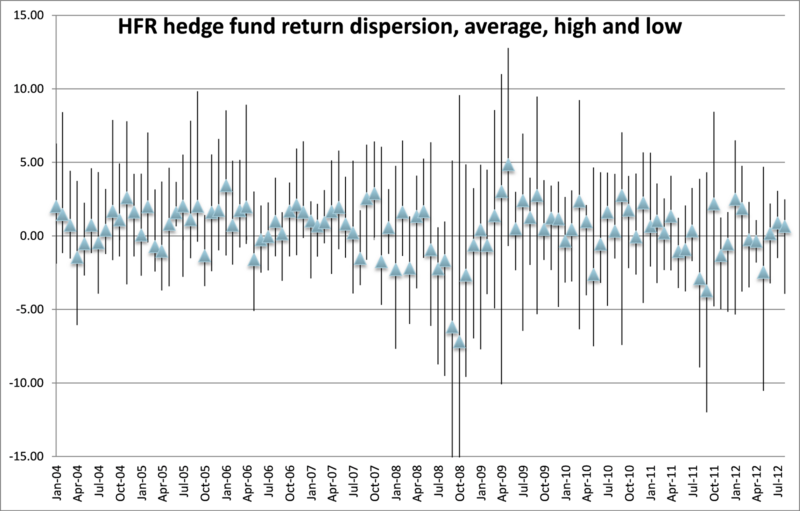 There has been a decline in volatility fore many strategies and a reduction in dispersion of returns. There was a strong increase in dispersion during the crisis but there has now been a dampening of spread. There has also been a slight decline in the average return and those averages have also shown more change. As long as this correlation matrix remains stable there will be continued demand for global macro and managed futures. 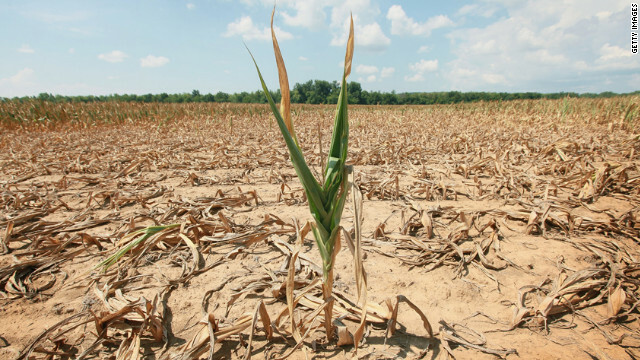 Economists are saying that the drought in the Midwest is the worst drought since 1956. The result has been a showing shortfall of corn.and soybeans. There will be shortfall of supply relative to usage for the first time since 1974 which is when we had the Great Grain Russian Deal. A shortfall of supply relative to demand has occurred only twice since 1960 for corn and five times for soybeans. Those event were likely to have a greater impact because there was no South American supply. The current North American harvest will be the lowest since 2007. Domestic feed, food, and fuel production will represent 89 of total corn usage, the most in 40 years. Corn exports will be the lowest since 1975. World stocks to usage will the lowest since 1974. This is a problem that will not go away and will hang over the corn and soybean market even when focus switches to South America. Hording will occur as farmers hand onto supply under the expectations of higher prices. demand will have to be rationed. Volatility will stay high and the price range should stay above last year's levels. Bill Gross has now stated that US debt is the "crystal meth" of the US. Again, the underlying theme of slow economic growth is tied to the debt problem and the "This time is different" meme of Reinhart and Rogoff. The drug analogy is a version of the classical economist of the 1930's who stated that the debt must be purged from the system. 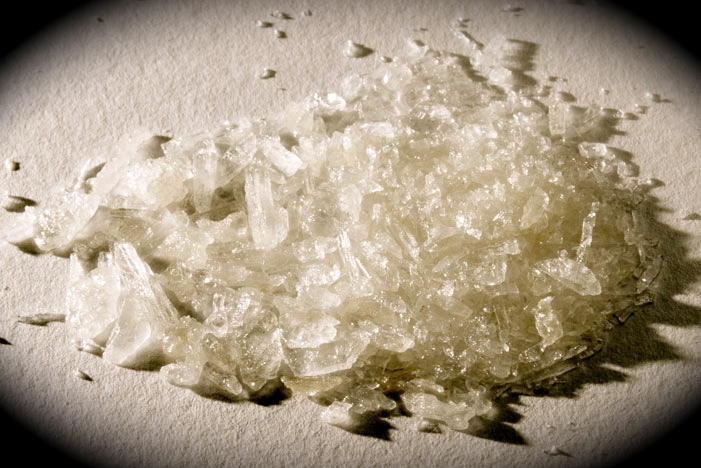 If you want to use the drug addict analogy, the answer may not be cold turkey but a slow glide to reduced dependency. This analogy should apply to the US. Debt levels have to come down but in a manner consistent with structural change and cyclical stabilizers. We should run deficits during a recession and build a surplus during good times. The government deficit should be close to zero over the long-term. Consumer and corporate debt should be consistent with long-term growth which suggest that its growth should not be multiple highers than the growth rate of the economy. Larry Summers and I (Brad Delong) say, and said, and will say: THE FISCAL MULTIPLIER DEPENDS ON THE MONETARY POLICY REGIME. AT THE ZERO LOWER BOUND THE FISCAL MULTIPLIER WILL BE LARGE THAN IN A MONETARY POLICY REGIME OF SUBSTANTIAL OFFSET. The main finding, based on data for 28 economies, is that the multipliers used in generating growth forecasts have been systematically too low since the start of the Great Recession, by 0.4 to 1.2, depending on the forecast source and the specifics of the estimation approach. Informal evidence suggests that the multipliers implicitly used to generate these forecasts are about 0.5. So actual multipliers may be higher, in the range of 0.9 to 1.7. The estimation of the fiscal multiplier, which tells us the bang we get for each buck of government spending, is the driver for the future of the global economy. if the multiplier is low, below 1, then for every dollar spent by the government there will be less than a dollar of GDP generated. If multipliers are low, then the government should not engage in deficit spending. One the other hand, we can increase aggregate spending if we have a multiplier above 1. The choice within the election could be based on what you think the multiplier will be. Of course, this number is not stable.Tthe choice of policy will make the multiplier different and the time period reviewed will show a different estimated multiplier. Now we have evidence that the IMF believes that the multiplier is actually higher than originally estimated. The new estimate suggest hat there is room for more fiscal spending. There is also evidence that the multiplier will be affected by the monetary regime that you are in. If there is a low interest rate environment, there will likely be a higher multiplier on the fiscal side. A zero rate environment would be a perfect environment for fiscal policy to be used to shift aggregate demand. The evidence is spotty, but there is a strong case given the current growth uncertainty to try and boost aggregate demand through some further government stimulus. (Philippa Dunne of the Liscio Report noted wryly, "Our old friend the eat, drink, and get sick sector (bars and restaurants plus health care) accounted for 52% of total job gains." Any job is a good job for someone who is unemployed, but income levels are increased through jobs which have high valued added. The value-added could be measured by either the revenue per employee or profits per employee. 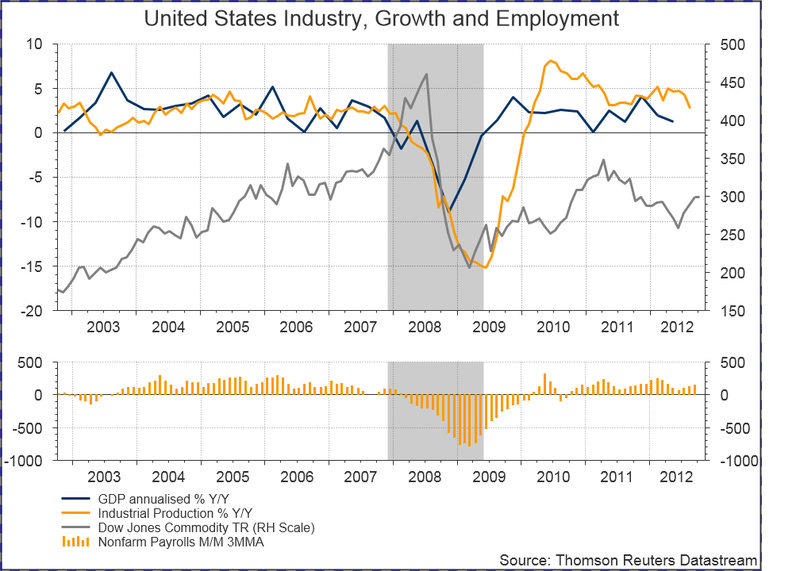 In this case, we are not seeing growth in manufacturing jobs or skilled positions, so it is hard to see how this employment report will lead to higher income and then consumption. We are living not in a material world but a financial repressive world. No one may feel sorry for the financial sector if this is happening, but it actually affects all investors and our long-term potential for economic growth. Financial repressions are policies taken by the government either explicitly or implicitly to help alleviate its debt problems. The objective of repressing the financial sector is to lower the cost of borrowing for the government. Periods of repression are characterized by low or negative real rates of interest which does help the financing of debtors. The objective of this financial repression is to take from savers and give to debtors. Of course, it is never stated in so bold terms It may seem like innocent policies to help those in need of reducing their debt burden, but the reality is that it is a tax on creditors for the benefit of the government. The repression can take the form of directed credit by the government to control capital flows inside the country. It can come in the form of capital controls to stop the flow of wealth out of a country. These capital controls will lead to the deglobalization of the world's financial markets. It could be a Tobin tax to place sands in the wheels of finance. It may take the form of regulation to direct capital to the safe assets issued by the government. It can be in the form of restrictions on innovation with financial products. The result is all the same. there is an effort to reduce the cost of borrowing and reduce the free flow of capital to those places where it may receive a higher rate of return relative to those who think they need the capital. It is happening now and will continue as long as government deficits are increasing. The WSJ provided unique insight into the politics of the Fed as it described how Chairman Bernanke was able to gather a consensus on QE3. This is a big policy move because there was not agreement on the value of another QE. QE1 was a total of 1.725 trillion over 17 months. QE2 was $600 billion over seven months. QE3 will be $40 billion a month for an unlimited amount of time. 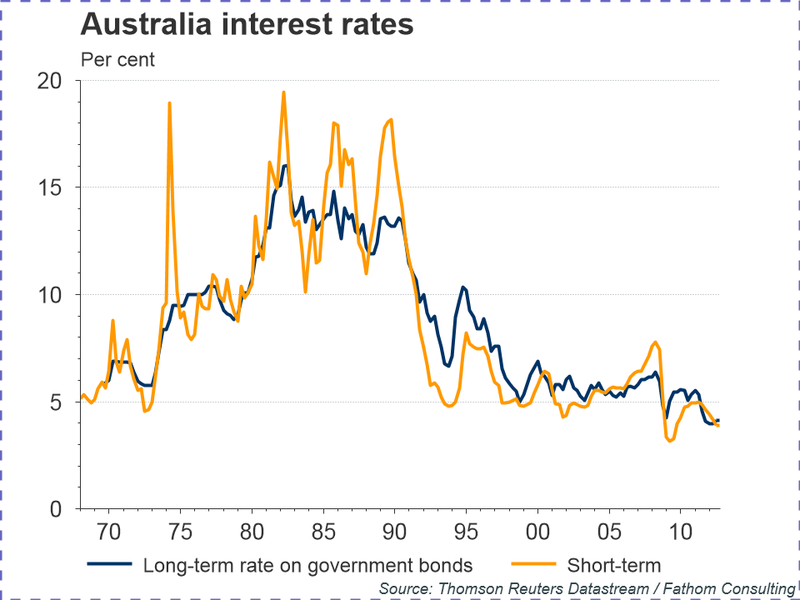 Albeit smaller in the term-term, it will be significant if it lasts as long as the forward communications on zero interest rates. The most interesting nugget of information that may have swayed the governors was the view that the unemployment is cyclical and not structural. This is based on the research of Edward Lazear presented at the Kansas City Jackson Hole conference. The Lazear work shows that the those sectors that showed the biggest decline in the recession also have showed the biggest gains during the recovery. The implication is that the unemployment that we see during this crisis is cyclical and will respond if there is a way to have monetary policy affect aggregate demand. This is a big if, but it seems as though that this argument drove the decision for more easing. Research does matter.